Members of the public, small business owners, local elected officials, and community leaders were urged to weigh in on Central Hudson’s proposed rate plan. Otherwise, the only points of view the PSC would be hearing were from big corporations and the utility itself. Through community outreach events and online efforts, over 1,500 postcards were collected from Central Hudson customers and hand-delivered to the PSC. 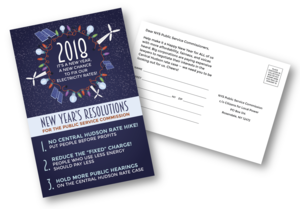 In addition to calling for a reduction in the fixed charge, the campaign aimed to raise awareness of the many concerns CLP had with the Central Hudson Rate plan. WHERE'S THE COMMITMENT TO CLEAN ENERGY? Central Hudson should immediately end its program to expand reliance on fracked gas and instead channel those resources into clean heating and cooling programs to fight climate change and reduce customers’ energy costs. Central Hudson can and should do much more to accelerate the electric vehicle adoption rate with targeted rates for EV drivers and incentive programs for charging infrastructure at workplaces. Central Hudson’s performance targets for supporting energy efficiency, renewable energy, and EV adoption should be much more aggressive. As proposed, the utility would be paid too much for doing too little. Central Hudson should be required to annually send customers a Department of Public Service-verified “scorecard” on utility progress in meeting these targets as well as on progress in reducing customer shut-offs. Central Hudson’s proposed “service size charge”—a new extra charge to residents for usage during times when electricity demand is highest—should be rejected. Central Hudson should offer residents a better, more flexible Time-Of-Use rate option that makes sense for working people and that can actually result in bill reductions. There should be no ratepayer-subsidized Fortis stock options for Central Hudson executives, and no increase in Central Hudson’s allowed profit rate. Our residents and businesses cannot afford a new $36+ million Central Hudson employee training center, at a projected annual operating cost of $1.6 million. Instead, the utility should form mutually beneficial partnerships with existing educational institutions and share on-site training facilities with neighboring utilities. Very few people knew about the first set of public hearings held in October, 2017. At least one more round of public hearings should be held to give the public the opportunity to voice their concerns and to make sure that residents, small businesses, and local governments are represented.